After many changes of our plan for the autumn of this year, we were able to adjust the terms of three national championships (Serbia, Republic of Srpska and Hungary) and to accept the invitation to this competition. By the way, after giving up of a couple of teams to participate, the big question would be whether this competiton will be held without access of Feniks, because of the small number of teams. Unfortunately, in this chaos a one-day tournament of Serbian Championship was canceled, which was the easiest problem to solve from our point of view. It is convenient here to remind you of the fact that in the Republic of Srpska exist the Super League, where six clubs are competing, as well. Like all the other teams of the 1st division, OKI Feniks had to make a decision before the beginning of league in regard to a hypothetical case to become a champion. Lining in that case would have to match the propositions of ECVD competition. We would achieve it with the probable loss of quality in the game. Since it is a big question whether it would not succeed in each game, because of the limited fund of players, we decided that the ambition for participation in the Super League - does not exist (yet)! 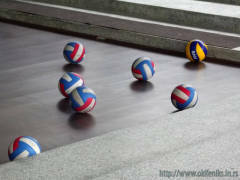 In addition, the gaming and financial burden would be much higher, because in Super league games are played one to one. We don't know all the teams, this is our first season, and, of course, we will reconsider this question for the next season again. 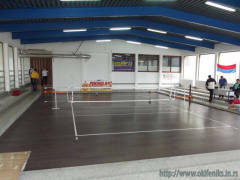 Tournament hosts have a cute little sport hall, designed specifically for this sport. The first appearance in the championship of the Republic of Srpska passed a certain disappointment. Our win against "Krajinik" was the only coomforting comparing to unexpected defeat of the hosts of the first round, OKI "Derventa." I am writing these few lines still under the strong impression of referee injustice that was inflicted upon us, but I think that I can estimate it objectively(*). It does not matter whether the referee errors were made by intention or ignorance, but the fact is that we were strongly cut out. The truth is that in those moments we did not keep our heads cool, but we let our emotions to lead us, and so out faults followed up in this story and dropped to inevitable defeat, 3:1 (22, -17, 20, 16). Marić, Đuričin, Brandić, Golijanin, Miloev, Anđelov, Herceg i Zaviin. The next round we play on the first weekend in November versus IOK "Borac" from Banja Luka in front the home crowd. 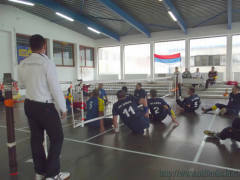 It will be in the "Vuk Karadić" school, and other details will be duly published in local medias. 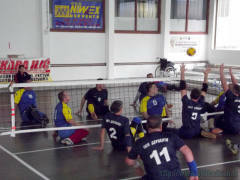 (*) - you need to keep in mind that the writer of this article (and all the other articles of this site, as well) is from the family with significant sporting reputation, a guy with 22 years of gaming experience in regular volley and 4 years of sitting volleyball, with 12 years of refereeing experience, and, finally, with the title of National referee (at that time the title was "Federal referee").